Welcome to MMIR Version 6.0! MMIR is designed to save you time and effort when submitting warranty claims, SDRs, and MISs. Many entries are available via pull-down menus; this increases speed and efficiency and eliiminates text entry errors. Also, redundant information is consolidated. For example, instead of having to repetitiously fill out separate fields for your aircraft's make and model, registration number, serial number, date and hours at delivery, you enter that information one time into your MMIR fleet roster. When entering a report, you just select a specific aircraft from a pull-down menu, and all relevant fields are automatically populated. The same applies to your engine inventory, and the companies you do business with. It's easy to add, edit, or delete your specific information, either from the MMIR data entry form directly or by using the Account Maintenance feature from the Full Access System Menu. See Chapter XV: Maintaining Your Account. Service Difficulty Report (SDR) Depending on your operation, SDRs may be a requirement under Federal Aviation Regulations. Even if not mandatory, the FAA accepts and encourages SDRs from any operator experiencing premature part failure. This information is extremely valuable to other operators, technicians, and manufacturers. The sharing of this information is a fundamental benefit of MMIR. Here are some general guidelines for submitting SDRs. Warranty Claim This MMIR form contains the fields that manufacturers need to process warranty claims. Most manufacturers accept printed MMIR forms for warranty claim purposes. If you do regular business with a manufacturer and would like the option of electronic claim submission via MMIR, contact us and we'll try to arrange it. 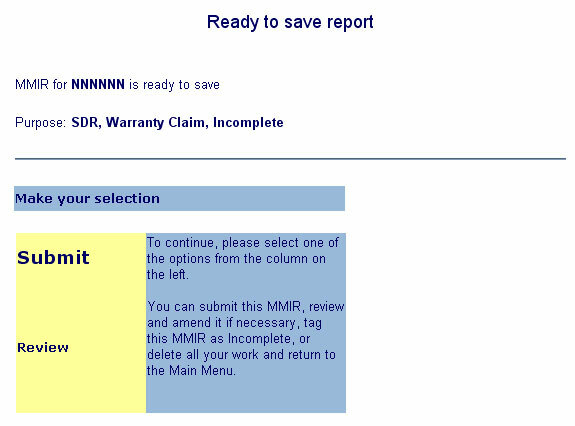 The MMIR warranty claim form has a searchable field not found in other forms: the "Open" and "Closed" buttons. When used, these buttons help you keep track of those claims that have been submitted but not responded to by the manufacturer (Open) and claims that have been processed (Closed). For information on changing the warranty claim status AFTER submitting a report, see Chapter XII. 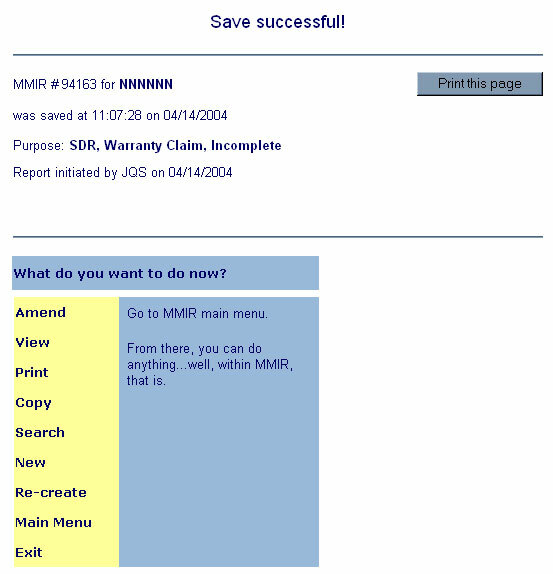 Warranty Claim plus SDR This is the most-used form in MMIR. It is a combination of the previous two forms, and saves you time and effort if you're submitting both a warranty claim and a Service Difficulty Report. Mechanical Interruption Summary (MIS) Certain operators are required to file MISs. If you operator under FAR Parts 121, 135, or 145, you can use this form to file mandatory MISs. MMIR (Information only) For parts failures that do not fall into the above categories, you are welcome to submit a report solely for the MMIR database. There is no such thing as too little information. Internal Use The "Internal Use" form selection displays all the available fields from the SDR, MIS, and Warranty Claim forms. The form is automatically tagged as Internal Use. "Internal Use" is perfect to write reports that will remain internal to your company. The information contained in Internal Use reports is NOT included in MMIR analysis queries. After selecting your choice, click Go. The appropriate form appears on your screen. You will have the option to designate that the report is Incomplete. Internal Use reports and Incomplete reports are NOT sent to external parties. Internal Use reports can be used any way you deem appropriate; the information always remains internal to your company. Incomplete reports and Internal Use reports may be reviewed and amended as many times as needed. If you want to submit an Incomplete report to an external party, such as a manufacturer for a warranty claim or the FAA as an SDR, simply uncheck the box at the top of the form. 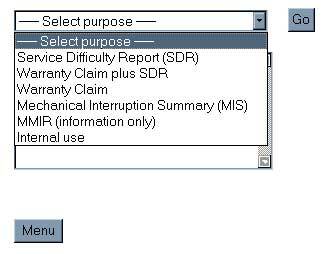 If you want to change an Internal Use report to a SDR or warranty claim, just open the report and then choose the correct form from the pull-down "Select Purpose" list.
! Tip Don't worry about selecting the "correct" form if you do not intend to submit it right away. You can change the type of form even after you start; MMIR will save all the information you already entered. Once the report has been submitted as finished (i.e., NOT Incomplete), IT CAN NO LONGER BE CHANGED. This is to eliminate confusion between the parties. As a Full Access user, MMIR offers you the option to send a corrected report, referencing the original report. See Chapter XI. This "Finished" page tells you the MMIR record number, when it was saved, the purpose, and the initials of the person or persons who have been working on it. Your options to proceed are listed and explained. In the "Submitted to:" pull-down menu, MMIR automatically includes those manufacturers that accept warranty claims electronically. These companies are identified with the "(online)" indicator. Let's say you make a mistake and realize it AFTER you submit a report. (Yes, you don't make mistakes, but this User Manual is written for everyone.) MMIR won't let you alter a report once it has been submitted. No problem! If you are still on the Finished screen, just click the "Amend" link. You can't amend the actual report, but MMIR will generate a duplicate report, referencing the original report. Then just make corrections and re-submit. If you are using MMIR to generate a paper warranty claim and make a mistake, but haven't yet mailed or faxed it to the manufacturer, you can still use the "Amend" function, or simply create a new report.
! Tip Better yet, just click the "Copy" link. Your report is duplicated, and you just have to correct the erroneous information! For more information, refer to Chapter XI, Editing and Deleting Reports.